Ever since Jim Harbaugh announced he would be implementing satellite camps this summer coaches from around the country have been grumbling, most notably coaches from the alleged "Best conference in the NCAA," yes the SEC. It began with Alabama's own Nick Saban, jumped to Auburn's Gus Malzahn, and most recently Dan Mullen from Mississippi State. All of these coaches have expressed their displeasure with the camps being ran, especially in "their territory." With the latest comments from Mullen stating that Harbaugh should "coach kids from Michigan." Now, the SEC does run some satellite camps themselves, but the SEC rule states that they cannot run a camp more than 50 miles from campus, but that does not post a problem because a large portion of the best talent in the country is typically within 50 miles from their campus, and have no problem showcasing their abilities to schools in the south. Nothing at all against high school talent in Michigan, or the rest of the country for that matter, but most experts argue that more talent is coming from SEC country than anywhere else. So with the SEC schools already owning a recruiting advantage because of proximity, why the comments against the idea of the camps? It's a very simple explanation: fear. SEC schools and coaches are scared. They fear Jim Harbaugh, and they fear the inevitable day that Michigan takes over the recruiting advantage in the south. The odds that they flat out fear Jim Harbaugh in general isn't out of the picture either, since the guy has been labeled as clinically insane by former players. 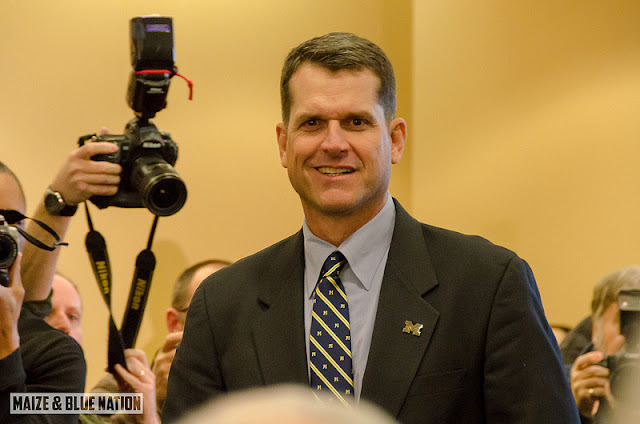 But coaches not only within the conference, but all over the country know that with Harbaugh not only returning to college football, but HIS college is going to change the recruiting game, and quicker than many expected. The SEC is going to continue to talk, and possibly label Harbaugh and his staff as cheaters for doing what they're doing, but if it's perfectly within the rules (which it is according to the Big Ten) they will continue to do it, and continue to see the benefits they get from seeing different recruits up close. Let the SEC talk, let them call Michigan cheaters, they're simply scared of what is going to happen in Ann Arbor. Michigan will continue the camps, and the SEC will continue to over-sign recruits. Fridays Future Huddle Kicks Off "Summer Swarm"